Apache here! Monday’s my day! Well and Linus and Stetson’s day too…Even though dad is feeling better now he still letting me take over the blog…YEAH!!! So what kind of mischief did we get into over the weekend? 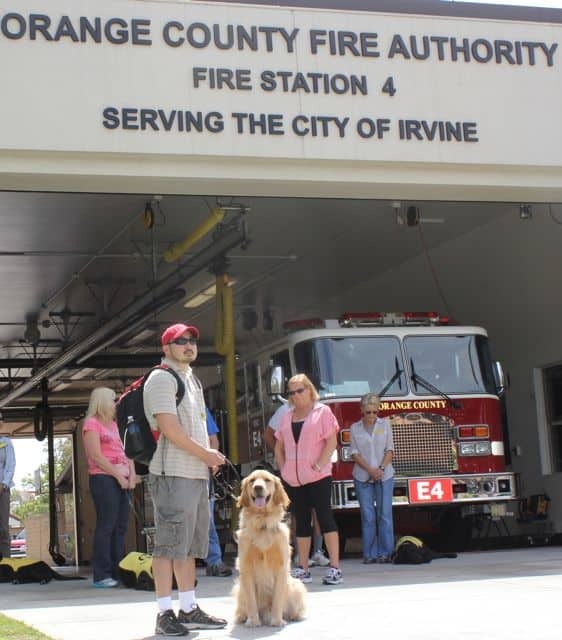 Well I won’t really call it mischief, but me and all of my guide dog puppy in training buddies took a trip to our local Fire Station. Dad says it’s important for us to get used to different sights, smells, and sounds and the Fire Station is a perfect place to visit. Dad said that last year Dublin who’s now working as a guide dog visited the same fire station and said hello to all the firefighters. If you want to see his video check it out at Dublin at the Fire Station. However, today it’s all about me and my trip! 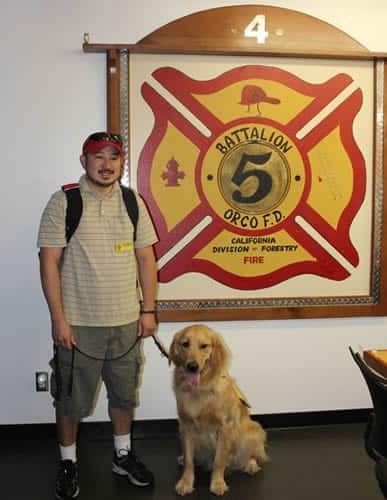 We got to walk around the entire fire station and smell all the smokey equipment, see fire fighting gear and also walk through the lounging areas. Ali got a good shot of Dad and me in front of this awesome sign! We went back outside and I got to meet a real live fire fighter in his gas mask! Some of the pups were afraid because he smelled funny, talked weird, and his breathing was like Darth Vader (according to my dad). I didn’t care! I love attention and when I saw he was giving away free pets I put my face right in his lap. Dad said no mischief then he asked me to jump up in the back seat of the fire truck. I started to, but said no and instead went to lick dad in the face. At the end of the day we all visited the Farmer’s Market then grabbed lunch. All of us puppies in training worked hard at the fire station so we passed out under the table during lunch and took a nap. I hope everyone had a great weekend! Make sure you say “hi” next time you see a fire fighter. They’re our new favorite! Linus, Stetson, and Apache write a guest post every Monday called “Monday Mischief“, where they talk about their mischief, antics, and adventures from the past weekend. Ooooo what an adventure you had Apache. You got well deserved pets and snuggles for being such a good boy! I’ve never been to the fire station before, let alone seen one! 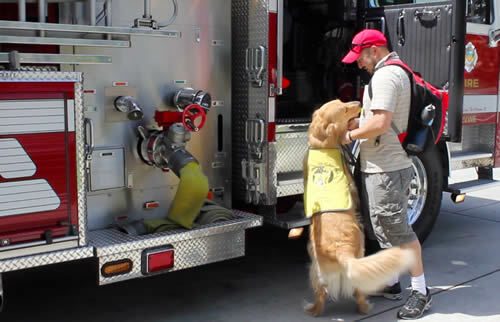 Except for the time Caesar Millan featured a firefighter dog in one of the episodes of The Dog Whisperer! That Firefighter Dalmatian Dog was way cool! I’ll remember to say hi to a firefighter and his dog if i meet either of them in the future! It was fun going to the fire station. 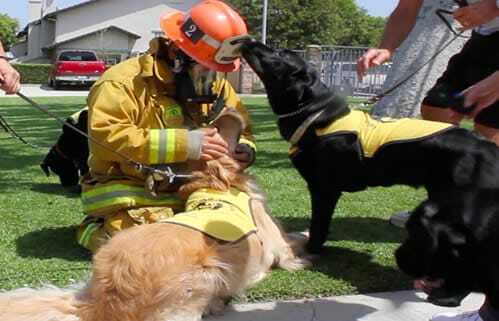 Some dogs are scared of the noises, smells, and the crazy outfits firefighters wear. I love attention though and I was happy to walk right up to that firefighter and sit on his lap. Hey Apache, let me just give you a good old doggy scratch because you didn’t get up the fire truck. I hope your dad is all better now. I just dropped by to greet you a happy weekend. Dad is feeling pretty good now. I liked the fire truck, but it was a little steep getting up into the back seat.